Many contracts provide that, where a breach of contract is remediable, the breach will only give rise to a right of termination if the party not in breach has given the party in breach written notice requiring that the breach be remedied, and the party in breach has failed to remedy the breach within some defined period following the giving of the notice. 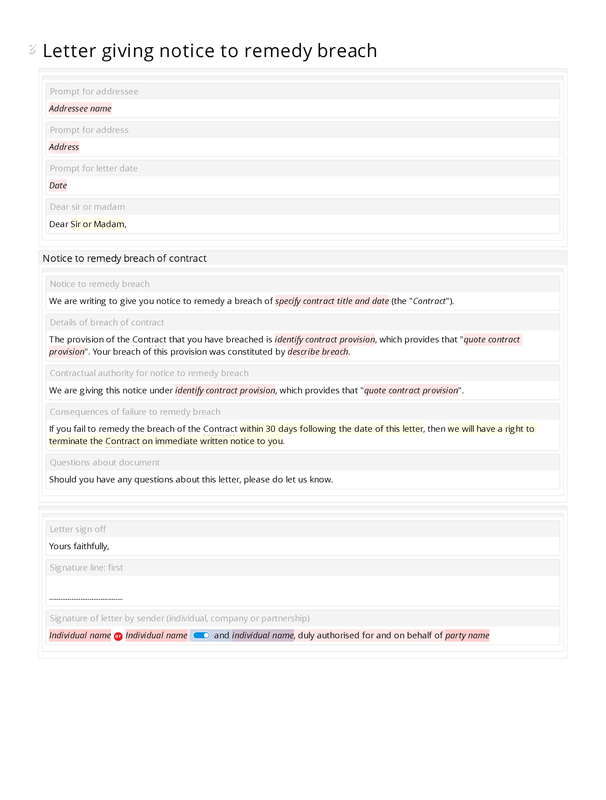 This breach of contract letter template is designed to assist in the production of such a notice. The termination (or attempted termination) of a contract may give rise to liabilities of various kinds, and we therefore recommend that you take legal advice before terminating (or attempting to terminate) any contract. Notice to remedy breach; details of breach of contract; contractual authority for notice to remedy breach; consequences of failure to remedy breach; questions about document.